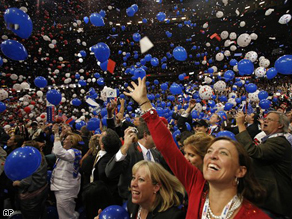 Delegates look up as the balloons fall after Republican presidential nominee John McCain concluded his speech at the Republican National Convention in St. Paul, Minnesota, Thursday. We have been on quite the adventure tour the past couple of weeks...all to talk with you, the voters, all over the country. What seems like forever ago, we started our travels in Encinitas, CA where we watched the DNC with some senior citizens. We moved on to Arizona to talk with Latinos and on to Louisiana to talk with young professionals. It was a mad scurry to a sporting goods store to pick up rain gear when we stopped for a few days in New Orleans to get nice and wet while covering Hurricane Gustav. We then we packed up the cars and drove to Florida to kick back up our voter tours. It was in Pensacola that we talked with conservative evangelical Christians and hopped another flight up to Virginia to talk with women. It’s been fun talking with voters to get a real sense of what our country’s voters are thinking. We chatted with so many great people while watching the conventions and dining over everything from fish tacos to gumbo to burgers. We watched reactions to Obama’s acceptance speech, to the selection of Gov. Sarah Palin and McCain’s performance last night. The opinions were very interesting, some very passionate, many still undecided. We are now sitting in a hotel putting together our stories on how evangelical Christians and women reacted to the conventions which you will see tonight. Last Friday night, August 29th, 2008 was three years to the day of Hurricane Katrina. And there I was, packing up my house, scrambling to whip up an evacuation plan to family in Baton Rouge: Gustav loomed on the horizon. I work as the Louisiana field representative for Oxfam America, the international humanitarian aid agency, and have spent the past two and a half years in the rural coastal communities south and west of New Orleans as part of the long and heartbreakingly inconsistent recovery from Katrina and Rita. My role in Oxfam’s work is to link small, local non-profits who are renewing these very communities to resources and opportunities that sustain their good work and amplify their voice. 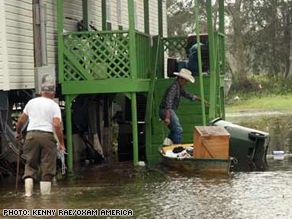 Prior to Hurricane Gustav making landfall in Cocodrie this weekend, one of the community groups that Oxfam’s Gulf Coast Recovery Program supported was Bayou Grace Community Services. As I headed back to Gustav’s ground zero, Terrebonne parish, the day after the storm I spoke with Courtney Howell, Bayou Grace’s now evacuated Executive Director who formed her organization when Hurricane Rita brought over 6 feet of water into her community, Chauvin. She has spent the past three years helping her area recover holistically, as well as to get more informed and involved in its own sustainability and wellness. Courtney is a Gulf Coast leader in the call for citizens to realize one very important thing: Those levees that the media couldn’t take its eyes off this week are a third line of defense. 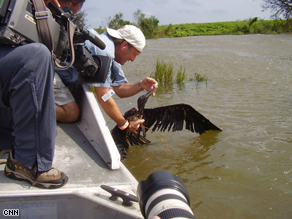 Plaquemines Parish's Coastal Management Director PJ Hahn cleaning the distressed bird. I went about and hour and a half south of New Orleans to check out a potentially serious levee breech in Plaquemines Parish. Photographer Leon Jobe and I got on an air boat with a local guy, Jimmy, and the parish's Coastal Management Director PJ Hahn. 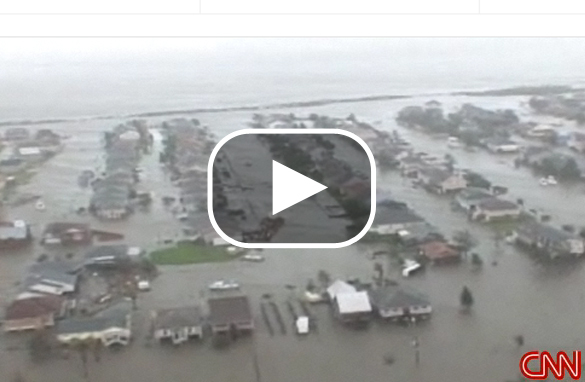 What we saw was a major collapse of the levee, but fortunately no homes in immediate danger. On our way back to the car, Jimmy spotted a bird in distress. The cormorant, which looks a lot like a seagull, was desperately trying to stay afloat. It was wrapped up in debris from the water, and being eaten up by fire ants. PJ reached in and helped free the bird of the debris, and washed the fire ants off. He then tried to check and see if its wings were broken. Luckily, it looked as if the poor thing was just exhausted more than anything. We took the boat back to the levee and dropped off the bird. Hopefully, the poor thing had time to rest and get back on his way. 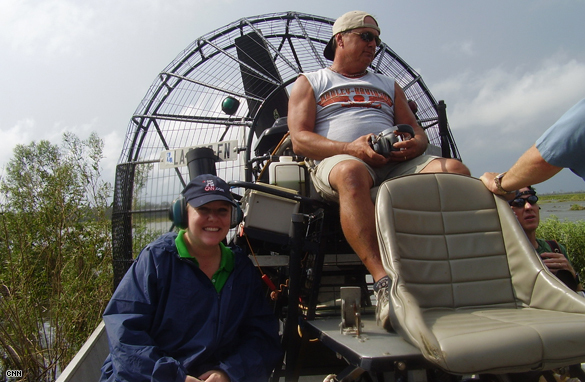 Here's one more picture: me and "local guy" Jimmy on an air boat south of New Orleans. Where are all the people? I've never seen a big city with empty streets and sidewalks, and even though I knew New Orleans was evacuated, seeing what that meant was TROUBLING. 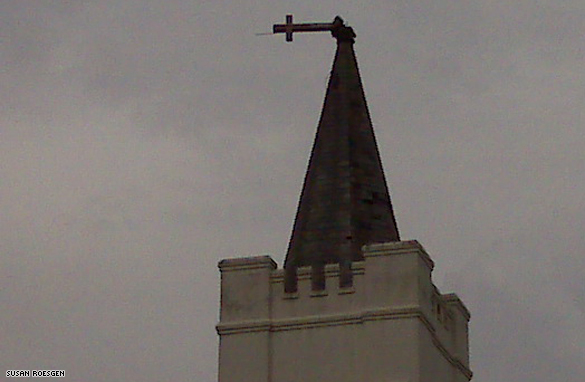 But the lack of much visible damage became reassuring. From a couple hundred feet in the sky, I could see that even the Riverwalk area, at the edge of the water, had been spared. Not so for the Biloxi-Gulfport coastline. There, a few wrecked boats and many flooded houses showed where the storm surge left its mark. In one hard-hit area, we circled around a large residential area, as the crew checked whether anyone had been trapped and needed rescue. Fortunately, everyone seemed to have evacuated this locale as well. 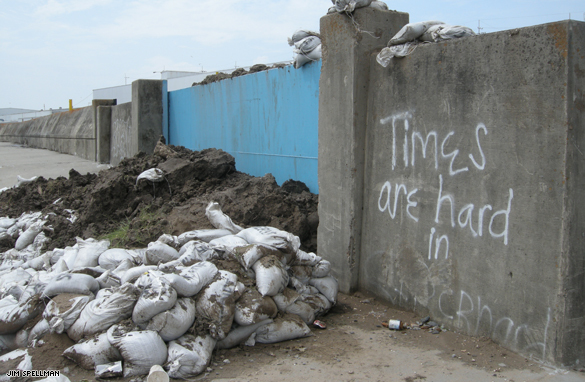 The sign reads "times are hard in St. Bernard" and whatever spray paint poet wrote it has got it right. 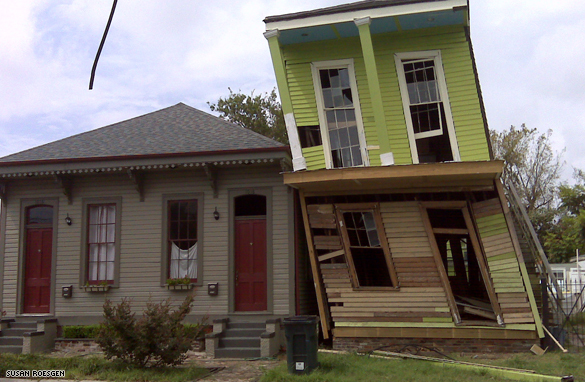 Its not so much that Gustav brought hard times, the damage here from wind, water and a few levee issues has been relatively minor, but walking the neighborhood’s streets here makes it clear that three years after Katrina, the mess from that killer storm still remains. Across the street from the sign sits a house with another kind of spray painted sign–the familiar cross with the number that search and rescue folks left behind. 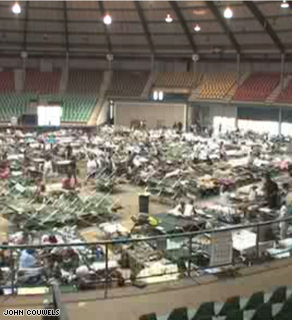 The View from inside the Coliseum shelter in Alexandira, Louisiana. The people who endured long bus rides to shelters far from home to escape Gustav are ready to go home. But now they have to wait, and the patience is wearing thin. So is the food and the plumbing. In Alexandria, Louisiana, local Red Cross volunteer Herb Boykin left the Coliseum shelter last night only to be called back to calm the evacuees. Gustav, Hanna, Ike, and now Josephine? 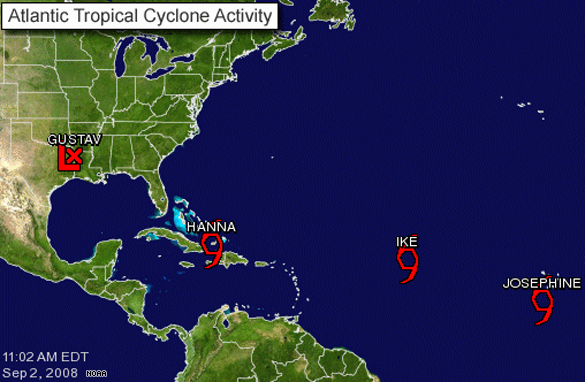 So yesterday I told you about the formation of Tropical Storm Ike. Looks like it's not going to calm down for a while. The National Hurricane Center says Josephine is the 10th named storm of the Atlantic hurricane season. Josephine has top sustained winds near 40 mph and is moving west at 15 mph. 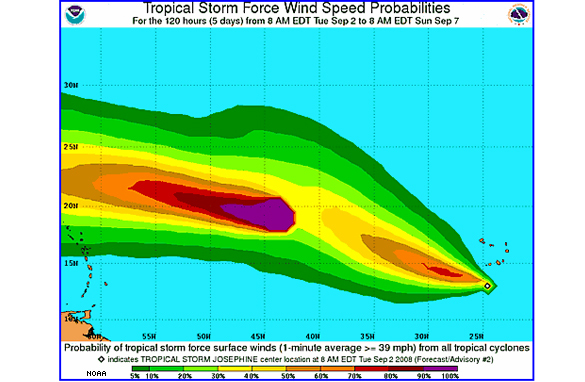 It could be near hurricane strength on Wednesday or Thursday. Right when we'll be dealing with Hanna, and possibly Ike. 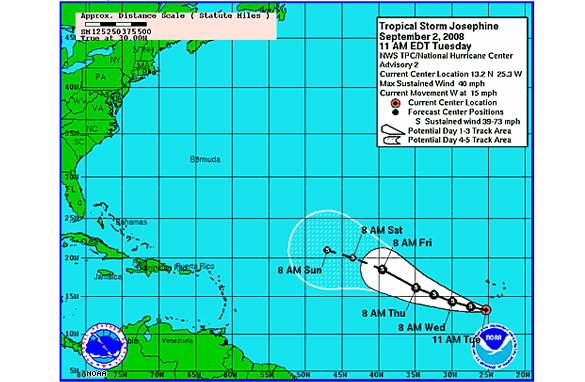 Now this isn't the first time Tropical Storm Josephine has appeared. 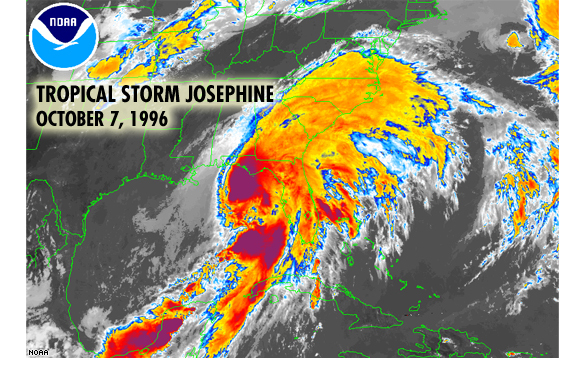 Back in October of 1996 there was another storm named Josephine, responsible $130 million dollars in damage (around $180 million in todays dollars). Let's hope we don't see Josephine make a second visit. Another sure sign this storm is over and a lesson from Katrina was learned. 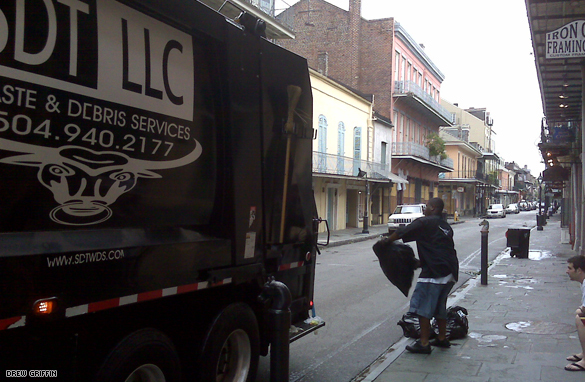 After Katrina, garbage sat for weeks in the French Quarter. This morning it's already being picked up. There are still plenty of problems with this city but you have to admit, the city was much more prepared for Gustav. This is a shot at 8:45 Tuesday morning on Royal Street. 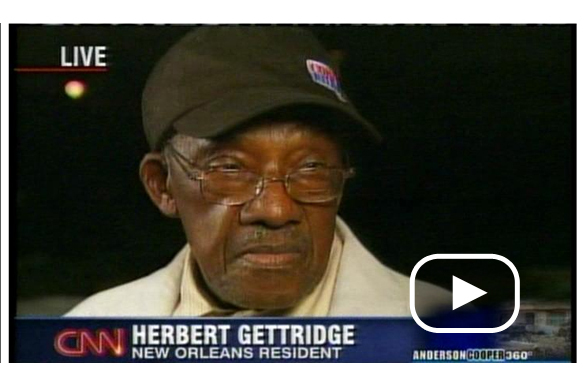 A lot of you have been asking how Mr. Herbert Gettridge is. I stopped by his house on Monday afternoon, and nobody was home, understandably. But the house was there with no water around it. Also, cell phone service was down most of the day, and my calls to him still aren't getting through. Our entire staff is wondering how he is, so I have made it my mission to find out. Will let you know when I do.